#58 Riley Porsche - Hurley Haywood / J.C. France, plus Roberto Moreno / Joao Barbosa. “We have put these teams together because we are coming to Daytona to win,” said Brumos Racing team owner Bob Snodgrass. He’s had the driving talent to win the Rolex 24 in the past, but even Porsche factory drivers couldn’t manage the required pace in the Fabcar Porsches (although the lead Red Bull car ran strongly just under a year ago). This time, for the first time in the current era, Snodgrass will have the drivers to win and the cars. 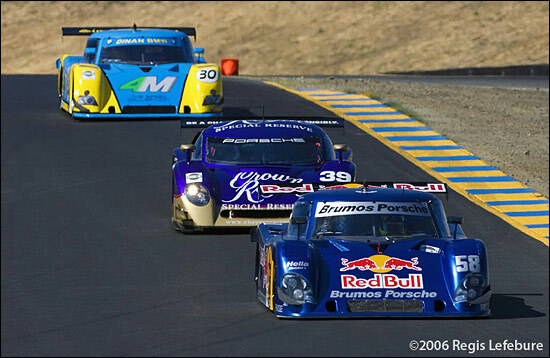 Brumos Racing has won this event overall on four occasions in the past : in 1973, 1975, 1978, and in 1991. It’s been a long wait. The team has been in engine / ECU trouble at both of the recent Rolex tests, but with time to solve those issues, perhaps a 16 year wait will be long enough.